Installation artists Carolyn Healy and John JH Phillips collaborate with performer James Osby Gwathney Jr. to create a multimedia work based on Whitman’s “Poem of The Road.” The piece takes place on a large industrial barge on the Delaware River and features video, sculpture, lighting, and electronic sound in an environment in which Gwathney performs the entire text of Whitman’s poem. 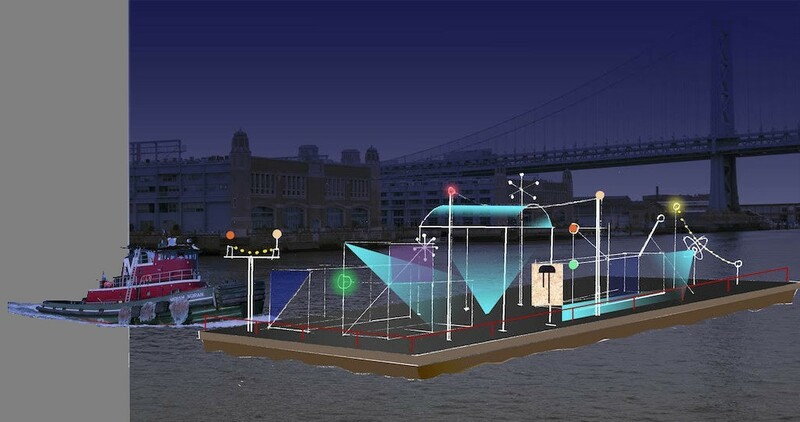 While a tugboat guides the barge from Penn’s Landing, where the audience boards, to a point downriver and back, the audience freely follows Gwathney as he recites the poem, traveling with him along the 130 feet of the barge deck through the structures of the set. The artists hope the experience of being afloat on an unusual vessel in the middle of the wide river under night clouds and stars creates both a sense of unease and exhilaration that resonates with the poem. Whitman frequently made the crossing from Camden to Philadelphia, especially to hear opera, one of his favorite art forms. The artists wish to create a unique tribute to Whitman that can be experienced both from the waterfront and by the audience on board the barge. Healy and Phillips have previously designed settings for sections of James Joyce’s Ulysses (at Symphony Space and La MaMa in New York and the Cini Foundation, Venice) and Finnegan’s Wake. *Tickets will have limited availabilty. Please check back for more information and to reserve your free spot. Rain date is June 6th. This performance is organized in conjunction with the University of Pennsylvania Libraries with major support from The Pew Center for Arts & Heritage.